The Jewelry Exchange and Jewelry Factory comes from humble beginnings. Bill Doddridge, founder and CEO, cut his teeth by working in his stepfather’s pawnshop. After running his own pawnshop, Bill started designing his own jewelry. In the early 90s Bill transitioned into a more traditional jewelry business model, closing his pawnshop and opening a traditional jewelry store. In many ways Bill was a visionary, taking advantage of globalisation. Other than the huge retail chains, Bill was one of the first retailers to go directly to the manufacturing companies overseas, allowing him to undercut the competition by 30%. I remember how fondly Bill was regarded by the major diamond companies in Tel Aviv (at the time, Israel was the largest exporter of polished diamonds). Under the parent company of Goldenwest Diamond Corporation, they now operate 15 stores sprinkled around the United States. 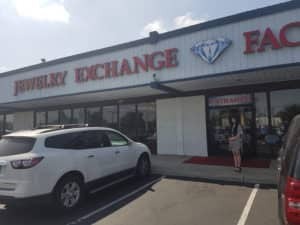 I’m not sure why, but some of the stores use the name Jewelry Exchange while others use Jewelry Factory. This was a new one for me. From the outside, the Jewelry Exchange in Tustin, CA looks like your typical strip mall store. Walking in, you notice a typical, if somewhat dated, store look. But then you start to notice some, how do I say this politely, unique aspects of the store. A security guard ushered us over to an old school ticket dispenser. The last time I saw one of those was in an old school Hungarian bakery in Brooklyn. And that was 15 years ago as well. Once we took a number, the gentleman asked what we would like to see today. After saying we are looking for engagement rings, he gestured towards that section. As we turned our backs on him to head to the display, we had the crap scared out of us. Apparently they feel it’s necessary to announce our presence. He did so by shouting into a megaphone right behind us. An honest to goodness megaphone. After that, the experience settled down into a more normal jewelry store experience. The introduction surely stands out, but I’m not so sure that’s exactly what you want when making a luxury purchase. Things were a little surprising here as well. 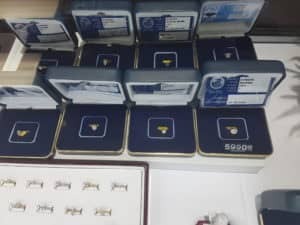 A few years ago, when I first joined Ira on this site, I made an unplanned visit to a different Jewelry Exchange location (in Hackensack, NJ). This was before I was writing reviews, so I didn’t take great notes about the experience. But every diamond I was shown was a horrific diamond with an EGL certificate. Another issue was the terrible sales staff the first time around. This time, the experience was markedly better. We were promptly helped by someone who seemed friendly and knowledgeable. This time around, the diamonds weren’t too impressive, but at least they had GIA certificates. They did have EGL certified diamonds proudly displayed, but the saleswoman shied away from them. The first one we looked at was a 1.09 G color I1 clarity for $4,785. We’ll get to the price in a minute, but the quality was very low. The inclusions were readily visible, and you can notice the symmetry was way off (looking at the diamond, you feel like your eye-sight is crooked). The second diamond was a bit of an improvement. It was a 1.15ct F SI2 excellent cut round diamond for $7,233. This diamond was better cut, but once again the inclusion was quite noticeable. Another major concern was the Strong Blue fluorescence grade. This is a big no-no when buying a colorless diamond. So what did I think of the prices? Let’s compare and see. The first diamond came in at $4,875 on its own (we were looking at it loose). Here is a comparable 1.14ct G I1 very good cut from James Allen. Let me be clear that I do not like this diamond, but it has the same problems the Jewelry Exchange diamond had. This one will run you $3,410. That saves you about 30%. The second diamond was a little nicer, but still had some major flaws while clocking in at $7,233. Here is a superior 1.18ct F SI2 excellent cut from James Allen. As you can see, the inclusions are not readily visible on the James Allen diamond (it will be eye-clean) and the fluorescence grade is better. I would still be hesitant to recommend it (we don’t like medium fluorescence on F colors either), but it’s certainly a better choice. The James Allen choice will cost you $5,600, a savings of about 25%. This is ignoring the fact that you will save even more because the online purchase is tax free. 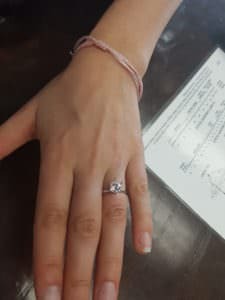 It’s not the high prices that bothered me at The Jewelry Exchange. As we explain (in our Should You Buy Online article), no physical store can compete with major online retailers like Blue Nile and James Allen. I understand (while not agreeing) with a consumer who is willing to spend a 30% premium for buying in a physical store. What makes me shy away from The Jewelry Exchange was the low quality of their product. By all means, pay a premium for your diamonds. But at least make sure the diamond is worth your money. Paying a premium for the in store experience (something you feel for a few hours of your life) while sacrificing on the quality of the ring you (or your partner) will wear the rest of your life doesn’t add up to me.